The Grey Stuff isn’t the only thing that’s delicious on the Be Our Guest menu! The ambience of the restaurant is gorgeous. There are three themed rooms corresponding to the layout of the castle in the movie. The main room is patterned after the iconic ballroom scene from the film with high ceilings, beautiful chandeliers, and an elegant layout. The West Wing is dark and foreboding with a slashed picture of the Prince as if a Beast ripped it up (like in the film). In it is a holographic rose slowly losing its petals. The East Wing is decorated beautifully but less opulent than the main room. 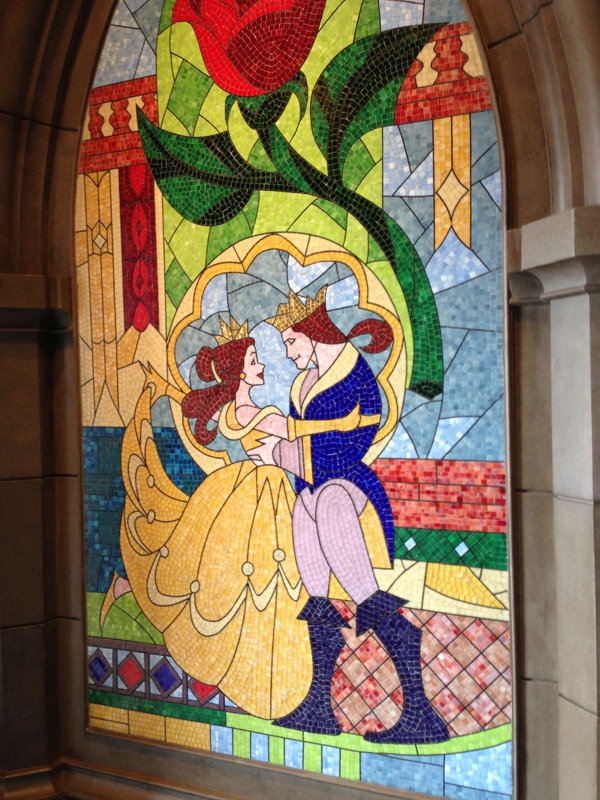 Paintings adorn the walls of Belle and the castle denizens with the Beast and in the center of the room is a beautiful statue of the the two of them dancing together. The food is impressive as well. As with most new Disney fare, it is a cut above average. I’ve sampled both soups, the roast beef sandwich, croque monsieur, braised pork (coq au vin style), the triple chocolate cupcake and the lemon meringue cupcake. The entrees are good but not overwhelmingly delicious. I really enjoyed the croque monsieur (a sophisticated grilled ham and cheese sandwich) and the roast beef sandwich. The horseradish bleu cheese cream sauce in particular made it extra good. But the real treat were the desserts. Now I haven’t had the “grey stuff” yet but at lunch they now serve a sponge cake topped with this special concoction called The Master’s Cupcake which I’m sure is terrific. My favorite was the lemon meringue cupcake which was so good I still think about it. Overall, there is little negative to say about this place except for the near impossibility getting in for dinner. I haven’t tried the breakfast yet, but considering it cost more than the lunch, it’s probably a pretty heaping amount of food. And if I ever do dinner, I’ll let you know. Still, even if you only go for lunch, you won’t be disappointed and it’s certainly worth the experience. We were able to get a dinner reservation there pretty easily but we went in September so there was probably less demand than in summer. Keep checking regularly as I was lucky enough to secure bookings for 2 nights. Checked randomly and was lucky enough to get one, then the other about a week later. Do you happen to know if you can have a look at the other rooms? Thanks! I have been lucky enough to be able to book in for 2 Dinners in june by checking back randomly. One night became briefly available and then the next night. Do you happen to know if it is possible to have a look in the other rooms whilst there? I’m trying to work out whether its worth 2 dinners at the same place. Thanks! WOW! I’ll have to try again then. Thanks, Karen! Yes, you are totally free to wander through the restaurant and I highly encourage you to do so. It’s pretty spectacular. It is probably the best place at Magic Kingdom, but there are SO many good places to eat (see the blog for more recommendations) that I would probably go once unless you plan on being at the park the whole day both times. Disney Springs (formerly Downtown Disney) has some awesome places to eat as does the Boardwalk area and of course Epcot is spectacular for food.